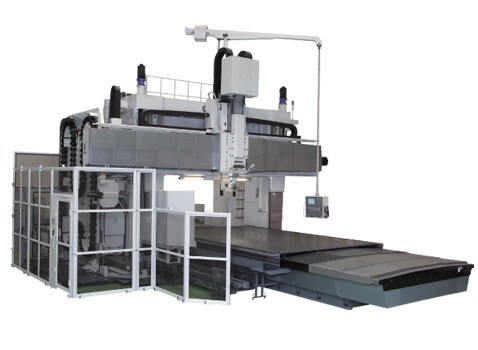 The versatile and efficient MCR-BIII double column machining center provides 5-face machining and the ram-type head features a 40 hp (30 hp continuous) 4,000 rpm vertical spindle for powerful cutting and rigidity. A single workpiece setup with various attachments can automatically perform a variety of machining functions, including angular and compound angular surface machining. A standard 50-tool magazine located on the side of the column provides automatic tool changing to the vertical spindle or the horizontal attachment. Watch how the MCR-BIII can handle heavy cutting and precise finishing of die/mold jobs and large, complex parts.